427 pages | 13 B/W Illus. In perceiving all rap and hip-hop music as violent, misogynistic, and sexually charged, are we denying the way in which it is attentive to the lived experiences, both positive and negative, of many therapy clients? This question is explored in great depth in this anthology, the first to examine the use of this musical genre in the therapeutic context. The contributors are all experienced therapists who examine the multiple ways that rap and hip-hop can be used in therapy by listening and discussing, performing, creating, or improvising. The text is divided into three sections that explore the historical and theoretical perspectives of rap and hip-hop in therapy, describe the first-hand experiences of using the music with at-risk youth, and discuss the ways in which contributors have used rap and hip-hop with clients with specific diagnoses, respectively. 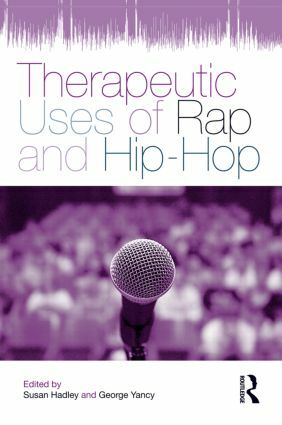 Within these sections, the contributors provide rationale for the use of rap and hip-hop in therapy and encourage therapists to validate the experiences for those for whom rap music is a significant mode of expression. Editors Susan Hadley and George Yancy go beyond promoting culturally competent therapy to creating a paradigm shift in the field, one that speaks to the problematic ways in which rap and hip-hop have been dismissed as expressive of meaningless violence and of little social value. More than providing tools to incorporate rap into therapy, this text enhances the therapist's cultural and professional repertoire. Yancy, Hadley, Give 'em Just One Mic: The Therapeutic Agency of Rap and Hip-Hop. Part I: Historical and Theoretical Perspectives. Hara, RAP: Requisite, Ally, Protector and the Desperate Contemporary Adolescent. Elligan, Contextualizing Rap Music as a Means of Incorporating into Psychotherapy. Lightstone, The Importance of Hip Hop for Music Therapists. Viega, The Hero's Journey in Hip-Hop and its Applications in Music Therapy. Veltre, Hadley, It's Bigger Than Hip-Hop: A Hip-Hop Feminist Approach to Music Therapy with Adolescent Families. Tyson, Detchkov, Eastwood, LaGrone, Sehr, Therapeutically and Socially Relevant Themes in Hip-Hop Music: A Comprehensive Analysis of a Selected Sample of Songs. Part II: Rap and Hip-Hop with At-risk Youth. Alverez, Beats, Rhymes & Life: Rap Therapy in an Urban Setting. Leafloor, Therapeutic Outreach through Bboying (Breakdancing) in Canada's Arctic and First Nations Communities: Social Work through Hip-Hop. Viega, MacDonald, Hear Our Voices: A Music Therapy Songwriting Program and the Message of The Little Saints through the Medium of Rap. McFerran, "Just So You Know, I Miss You So Bad": The Expression of Life and Loss in the Raps of Two Adolescents in Music Therapy. Ahmadi, Oosthuizen, Naming My Story and Claiming My Self. Lightstone, Yo Can Ya Flow! Research Findings on Hip-Hop Aesthetics and Rap Therapy in an Urban Youth Shelter. Ierardi, Jenkins, Rap Composition and Improvisation in a Short-term Juvenile Detention Facility. Donnenwerth, Song Communication Using Rap Music in a Group Setting with At-risk Youth. Part III: Rap With Clients in Specific Clinical Settings. Tyson, Hip-Hop Healing: Rap Music in Grief Therapy with an African American Adolescent Male. Steele, Beat It: The Affects of Rap Music on Adolescents in the Pediatric Medical Setting. Baker, Dingle, Gleadhill, "Must be the Ganja": Using Rap Music in Music Therapy for Substance Use Disorders. O'Brien, "Morphine Mamma": Creating Original Songs Using Rap with Women with Cancer. Dickinson, Souflas, Rapping Round the System: A Young Black Man's Journey through a High Security Hospital. Susan Hadley, PhD, MT-BC, is Professor of Music Therapy at Slippery Rock University. She is the editor of several influential books and has published numerous scholarly articles and book chapters. Her research focuses on feminism, race, disability, and psychotherapy. George Yancy, PhD, is Associate Professor of Philosophy at Duquesne University. He is the author of Black Bodies, White Gazes: The Continuing Significance of Race and Look, A White! Philosophical Essays on Whiteness. Yancy has also edited 12 influential books, three of which have received CHOICE Awards.